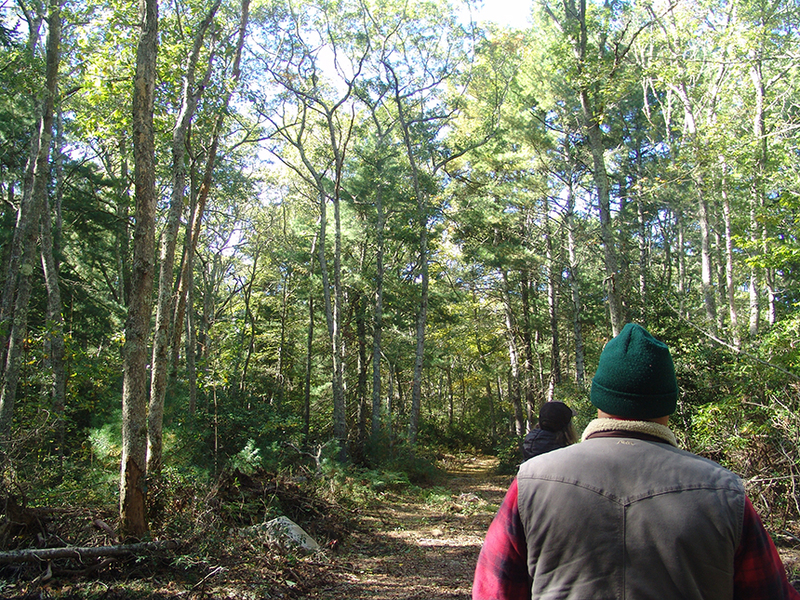 During an Oct. 18 tour of Wingover Farm’s “unique” forestland, the leaves of Rhode Island’s state tree, the red maple, were turning color and Largess and two colleagues, Daryl Ward and Kara Discenza, were constantly pointing out trees of all shapes, sizes, and ages. During the 60-minute tour, they counted nearly two dozen different types of trees, including American beech, American holly, black and white oaks, yellow and white pines, black tupelo, yellow and paper birches, sassafras, black cherry, and bigtooth aspen. And not just individual trees, but stands of black birch, groups of teenage and adult red maple growing together, and baby holly trees sprouting from the forest floor. Largess said having birch, holly, and beech together in one place was special. He used the word “special” a lot. He said the forest has an “impressive understory.” He noted that some of the tallest hollies documented in North America are in Tiverton and Little Compton. He said native forests of American beech are shrinking rapidly, especially in Connecticut and Rhode Island. With the population of the region’s American beech decreasing, Largess was thrilled to discover a large beech tree he repeatedly called “the mother tree.” He said the tree must be 300-400 years old and was surrounded by younger beeches, 150 or so years old, waiting to be the next mother. He pointed out beechdrops, a wildflower that lacks chlorophyll and produces brown stems on which small white and purple flowers appear July through October, growing under the forest’s majestic beech tree. The property’s other vegetation included, among many others, mountain laurel, a broadleaf evergreen shrub; sweet pepperbush, a shrub with fragrant white or pink terminal flower spikes in late summer; and winterberry holly, a shrub with copious amounts of bright-red berries that shine in the fall and winter landscape. Largess called the layered and biodiverse property, which includes a pond alive with frogs and fish, “a balanced ecosystem.” He said it would be an excellent location for the Rhode Island Natural History Survey to hold a BioBlitz, would make a wonderful outdoor classroom for local students, and could be a great future ecotourism site, as it could be tied into nearby Weetamoo Woods. Julie Munafo invited the Largess Forestry professionals on the tour to better understand what could be lost should the property be developed into an 11-megawatt solar facility. Munafo’s family has owned the Crandall Road property since the 1970s, but a pending sale could lead to some 40 acres of solar panels. The buyer’s proposed project would inevitably decimate forestland, ruin farmland, and destroy wildlife habitat. The family is torn by the pending sale of the property — Munafo, for one, doesn’t want to see the farm reduced to acres of solar panels. But the family was unable to come to an agreement with the local land trust or find a buyer interested in farming and/or preservation, according to Munafo. She said she believes the property is selling for about a million dollars. Largess, who has become a leading spokesmen for the preservation of trees and old-growth forests, said the farm’s open space is unique, as it features, in this order, open fields, young woodlands, and a mature forest. He was impressed with the property’s mix of vegetation, most notably its diverse collection of tree species. He noted that forestland like this “needs to be protected,” not turned into an energy facility, subdivision, or an office park. Preliminary damage from a possible solar facility on the property included the clearing of these American holly trees. The will, both public and political, however, needs to be there. The state, its 39 municipalities, its 1.06 million people, and a host of nonprofit organizations have been grappling with the issue for two years. The town of Tiverton, for instance, is pondering a solar moratorium until it can craft an ordinance that better addresses the siting of utility-scale solar energy. Site work in the woods of Wingover Farm, likely done to determine the property’s ability to host an industrial-scale solar project, has already claimed a number of trees, including a small stand of American holly. Once the trees are cut down and the solar panels installed, Largess said the development will clear a path for Russian olive, oriental bittersweet, and other invasive species to take root.